Phalaris arundinacea.Clinton C. Shock.Malheur Experimental Station.www.malag.aes.orgonstate.edu (Accessed 5/2014). Phalaris arundinacea is a perennial C3 grass (Kresovich et al. 1982), 70-150 cm, extensively and aggressively colonial by rhizomes, stems stout, branched, stem smooth. Leaves with sheath open, rather loose, hairless, generally shorter than internodes, ligule membranous, about 0.4 cm long; blades 10-20 cm long, 1-1.5 cm wide, dark green, somewhat rough on both sides. Flower spikelets 0.4-0.6 cm with one fertile floret; inflorescence dense, 7-25 cm long, at first open, green to slightly purple, soon becoming contracted, pale tan, fluffy-papery textured, branches ascending or erect, lower branches somewhat distant, the upper closely overlapping; blooming and fruiting May-Aug., but flowering mostly in Spring (Brown 1979). Origin: Apparently native to N. America but a cultivar introduced from Europe is more widespread and thought to have more potential for invasiveness than native type. Notes: Very invasive in parts of New York State. Originally cultivated as a forage grass. Seeds germinate immediately without dormancy. Tolerant of prolonged flooding. Apparently prefers alkaline water pH 5.5-8 (USDA, NRCS 2010). Forms dense monocultures (Apfelbaum and Sams 1987). 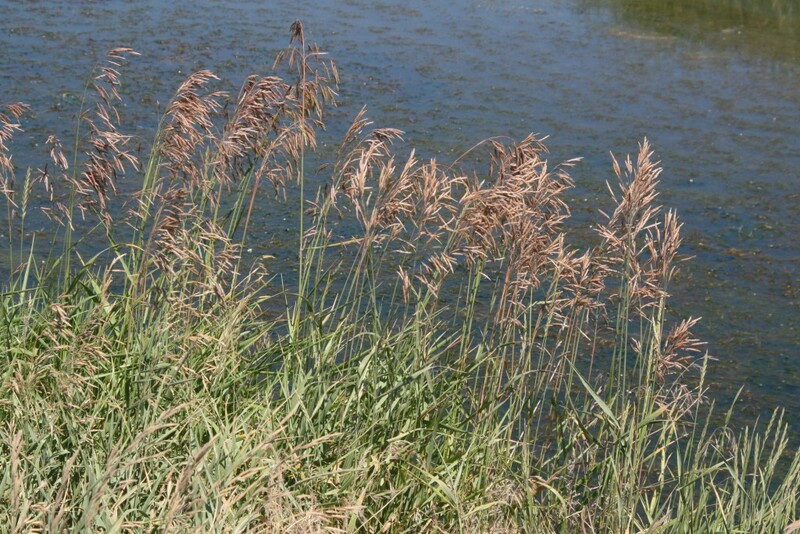 A study in a Wisconsin riparian habitat shown significant decrease in the occurrence of some other wetland species in an area where Phalaris was increasing (Barnes 1999). An ornamental variation with green and white striped leaves is called “ribbon grass”.